I am still amazed at how God works and speaks to us. Just this very morning, I sat, praying this same prayer. Lately my mind has been exactly how you described it. A pinball machine of thoughts racing around my head. I haven’t been able to pray the deep prayers I usually pray because my mind won’t let me. I asked God, why is this happening and please make it stop. Hormones are probably the culprit as I’ve noticed other bodily signs of such but I didn’t put two and two together. Thank you for sharing, and know that you are not alone. I’m guessing you, I, and millions of other women are in God’s graces with this same problem. Thank goodness He made us so He understands much better than we do what’s going on with our minds and bodies. You have no idea how much I appreciate your transparency. You put into words what so many try to cover up with a smile. Thank you. Thank you for being real. Thank you for reminding me that God is capable…and willing… to help me through everything I deal with, even my control-freak nature and my 43 yr old hormones. You are a blessing. Thank you for being an open vessel for God to use. 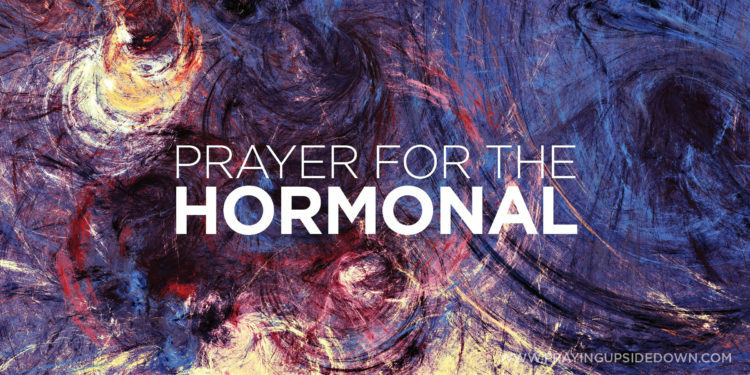 Thanks for this prayer after another round of my husband dealing with/tolerating my hormonal swings….so badly needed this prayed. Thanks for putting into words all those feelings, thoughts and actions. Thank you for this prayer! Since my divorce @ 8 years ago when I was @32 my hormones have been on a roller coaster ride after a complete “DUMP & CRASH”. I’ve prayed for GOD to return them at times and being single the past 8 years to “take” them or “CALM” them many times. I need REAL TRUE LOVE to experience full happiness in intimacy and it’s evaded me thus far and I’ve found myself very lost, confused and FRUSTRATED On every lEVEL multiple times over the past 8 years and recently faced with more confusion and frustration! Knowing I only have GOD to turn to and trust! I found your prayer and site today thanks to Google, hmmmm…none the less- I’m here, and I thank you! Ladies you’re not alone and hormones are very real….American woman in particular do TOO much day to day working multiple full time jobs when all their responsibilities are considered, equaling STRESS and DIS-EASE in the body……I’ve experienced it first hand before I was 30 working multiple JOBS plus the husband, household, and pets….after a few lifestyle changes I found myself happy and DIS-EASE free, but then years later another chapter came-DIVORCE after a 17 year relationship. With a child it seems to never end unfortunately. But anyway. The LORD knows our needs more than we ever will, and prayer works and I’ll read this prayer when I can’t form the words through the “brain fog”. Thank you again, and again!